Meet & Greet from member of our local team. The Yorkshire Dales Cycleway is a stunning circular tour of the National Park taking in most of the main Dales and many that are rarely visited. 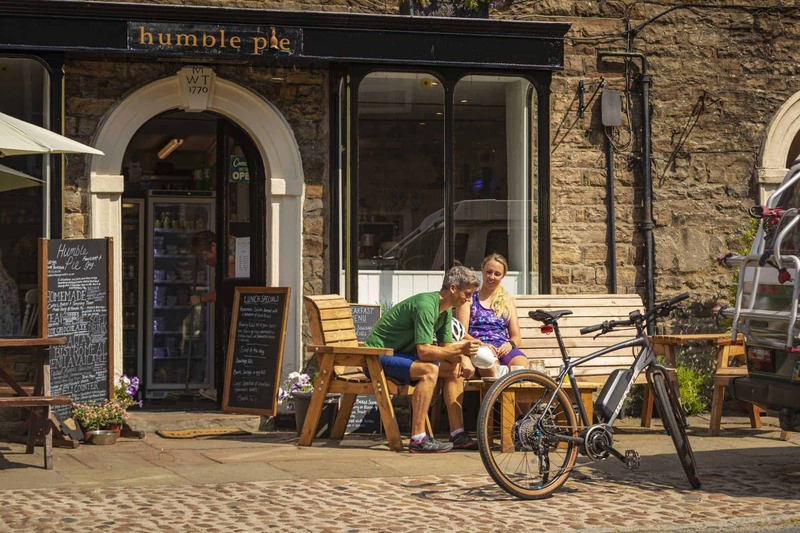 The breathtaking scenery combined with villages of immense character make this a wonderful way to experience the Yorkshire Dales on two wheels. The Yorkshire Dales Cycleway (YDCW) is a superb but challenging route that can start in Harrogate or Ilkley and is all on road and signed with the logo of the National Park – a sheep’s head. Many will find it is ideal for a leisurely six day tour, while others may wish to cover more than one section in a day. This tour is designed for those who wish to ride at a leisurely pace providing plenty of time to enjoy the full glory of what the Yorkshire Dales has to offer. Averaging 35km per day, you can easily complete the Yorkshire Dales Cycleway in 6 days starting and finishing in Ilkley. If you fancy doing more per day then we can start the Tour in Harrogate and extend the overall distance. Harrogate is a beautiful Spa town with lots to see & do. It is also hosting the 2019 UCI World Road Race Championships in 2019. There are plenty of places of interest and things to do along the Yorkshire Dales Cycleway route and you can use our guide to help plan each day. We meet you at the start of the tour and ensure you have everything you need and then transport your luggage between overnight stops. Accommodation is in carefully selected small hotels of character in typical Yorkshire villages that boast an array of good food options as well as traditional Yorkshire pubs. Day 1 - Arrival into Ilkley or Harrogate, check to the hotel with the opportunity to enjoy an evening in the town. Overnight stay. Day 2 - 32-50 Kilometres to Malham. Meet and greet: We will meet you and provide a briefing on the tour, supply a hard copy map and answer any questions you have. Not long after setting off you experience beautiful Wharfedale and watch how the valley changes as you cycle along the way. Plenty of typical cafes and pubs to stop off on the way today, but save time to experience Malham and the many things to see there. Day 3 - Ride 38 Kilometers. Malham to Ingleton. Take the Cove Road out of Malham right to the top of Malham Moor (the only big hill of the day) and enjoy the dramatic scenery (used in one of the Harry Potter movies) before descending down to the historic market town of Settle for a well earned coffee stop in the market place. The overnight stop is in Ingleton, a village dating back to the iron age, famous for its waterfall and caves. Day 4 - Ride 38 Kilometers Ingleton to Hawes. The landscape changes again today and you experience the barren moors near the famous Ribblehead viaduct before enjoying a lovely long sweeping descent into Wensleydale. Day 5 - Ride 31 Kilometers Hawes to Reeth. A ‘valley hopping’ day today as you go from Wensleydale to the northern Yorkshire Dales valley of Swaledale, covering some of the route of the 2014 Tour de France! The climb to the top of the moor is well worth it, just take your time before you enjoy the breathtaking views as you descend into the narrow valley with its small villages of immense character. Day 6 - Ride 37 Kilometers Reeth to Kettlewell or Grassington. A day of contrasting and graphic Yorkshire Dales scenery as you experience 4 valleys and 2 moors in one day! the final section of the route takes you up the ‘hidden gem’ valley of Coverdale before descending into Wharfedale for the overnight stop in Kettlewell or Grassington. Full balance is required 10 weeks before the date of your Yorkshire Dales Cycleway.